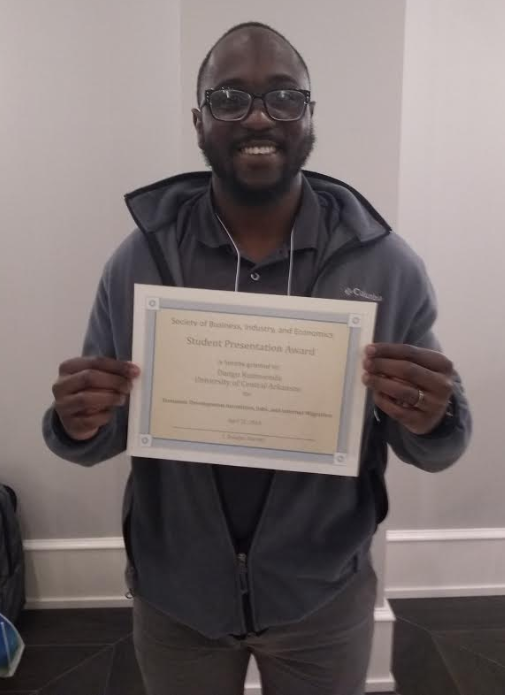 Dango Kumwenda, an ACRE Fellow and UCA MBA student, was awarded a “Student Presentation Award” at the 2019 Society of Business, Industry and Economics (SOBIE) conference on April 11th. Kumwenda is a part of ACRE’s Research Fellowship Program. In this program, students work with a professor to write a publishable research paper that is presented at the annual SOBIE conference. Kumwenda has been working with UCA Assistant Professor of Economics Weici Yuan to investigate the relationship between economic development incentives, migration patterns, and employment. Kumwenda and Yuan’s research paper “Economic Development Incentives, Jobs and Internal Migration” was the subject of Kumwenda’s presentation at the SOBIE conference in Destin, FL. Kumwenda’s and Yuan’s preliminary results find that state incentive programs do not increase jobs but may increase migration to states. In addition to winning an award at SOBIE, Kumwenda also published an op-ed for the Arkansas Democrat-Gazette titled “Bad incentives: Rich counties benefit most,” on April 1 arguing that Arkansas is misallocating its economic development incentives by focusing most of them in the richest counties in the state. For more of ACRE researchers’ work on targeted economic development incentives, go here.